The Gardiner Report is now finally available to the public and not a moment too soon. 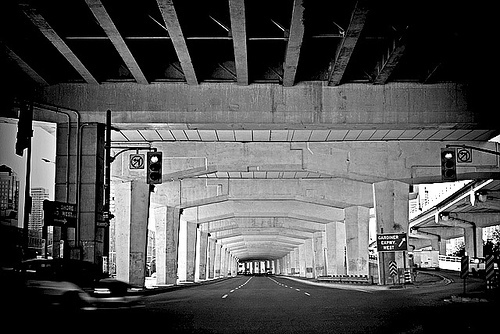 The report outlines four options for the Gardiner. The one that’s getting the most talk from the media and City Hall is tearing down a part of the elevated highway and replacing it with a widened Lakeshore Boulevard. Drivers weigh in with their thoughts, not all of them like the Gardiner it seems, but they’re right in thinking that the construction would cause serious gridlock. We personally want to remind our councillors that many of the people grumbling don’t vote or even pay taxes in Toronto so take what they’re saying with a grain of salt. The Star’s Jim Coyle points out that Senator Jerry Grafstein’s endorsement of Jane Pitfield bordered on insulting and almost smells of old boy’s club sexism. G. Raymond Chang is Ryerson’s new chancellor. The successful businessman is already on Ryerson’s board and has the school of continuing education named after him. We don’t care if it’s a photo-op we just like the fact that the business community got together to build a playground for some kids who need it. Over at Downsview they have a replica of the Avro Arrow. The best part is that one of the original men who worked on the Arrow in the ’50s worked on this reconstruction. A police chase ended up wrecking a woman’s porch. No one in the house was hurt. An unreliable witness means that two street racers who killed two people are only getting convicted of careless driving, a slap on the wrist. Photo by Henry Roxas from the Torontoist Flickr Group.